The other day, I mentioned that I didn't remember leg o' mutton sleeves in the 80s. Wo tonight, my guy and I have been watching the Doctor Who marathon on BBC America. Keep in mind that he is older than me. Fine with me, and my boys are very impressed that he has been a Doctor Who fan since it first came on back in the 60s. He's the only person they know who knows more about the show than they do. Heck, he's been quoting episodes from the 60s as we watch the rundown of all eleven doctors (now twelve, but since he hasn't started yet, they can't very well do a montage about him, now can they?). So we're up to the Seventh Doctor now, and what should we see but this, from 1986. 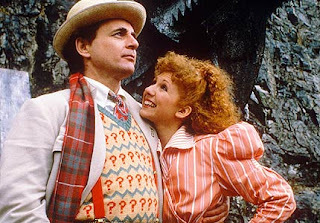 It's the Seventh Doctor with his companion Mel, right before he regenerates. So, I'll be darned, why don't I remember those sleeves, cause this was in my heyday? I dunno. Of course, who knows what year they were in at this point, given the time travel and all. One things for sure though -- they aren't larger on the inside. And for all you Whovians out there, what you think about the choice for the Twelfth Doctor?